Jeb Bush, the abundantly funded establishment candidate, used that line to exit the presidential race after coming in fourth in Saturday’s South Carolina GOP primary. Bush’s language was political, but it also evoked the Christian faith. Of the many Bible verses about having a servant mentality, Mark 9:35, for example, describes Jesus saying to his disciples, “Anyone who wants to be first must be the very last, and the servant of all.” The concept of “servant leadership” is widely cited in religious contexts, but also the secular ones of politics and corporate governance. That kind of language should have served Bush well in appealing to South Carolina’s Republican electorate — more than two-thirds of whom identify as white evangelical Christians. But by Saturday evening it was too late; South Carolina had voted and Bush had managed to win only 7 percent of evangelicals. Instead, a plurality — 34 percent — went for Donald Trump, about the same share as the state’s GOP primary voters overall. According to the Edison Research/National Election Pool, evangelicals even chose Trump over contenders like Marco Rubio (21 percent) and Ted Cruz (26 percent) who frequently cite their Christian backgrounds as a guidepost. Cruz, who won the Iowa Caucuses and outperformed polls largely based on evangelical support, has a national prayer team. Trump couldn’t or wouldn’t name his favorite verse of the Bible and has made gaffes including misnaming one of its books. Trump’s win among evangelicals was a bit of a surprise to the media — the cable networks hammered away at the issue, and on Sunday’s “Meet the Press,” Chuck Todd peppered Cruz with questions about why he lost the group that had supported him in Iowa. But the South Carolina results show evangelicals are a diverse group with sometimes differing priorities. Trump did well among less-conservative evangelicals but not among those who want a candidate who shares their values. And after all, two-thirds of South Carolina evangelicals voted for one of the other candidates instead. At a polling place in Mount Pleasant, a Charleston suburb, I spoke with Allan Woodbury, a 53-year-old small business owner who didn’t cite religion as a factor in his decision to vote for Trump. He made his choice because, he said, “I wanted the economy to get back on track.” He said that come November he would back whichever GOP candidate is the nominee. “But right now, I’m voting for who I want to win.” Others were less amenable — nearly half of Trump voters statewide said they would vote only for him. Two other voters I met — one in Mount Pleasant for John Kasich and one in North Charleston for Bush — said they would not vote for any other GOP candidates in the general election if their primary pick lost the nomination or dropped out. Later on Saturday I visited the elegant home of Kim and Chris Nickels, who belong to Seacoast, a major evangelical church headquartered in Mount Pleasant with campuses throughout the state. Chris described their community as one of the major Republican hubs of the Charleston area, which overall voted for President Obama in 2008 and 2012. 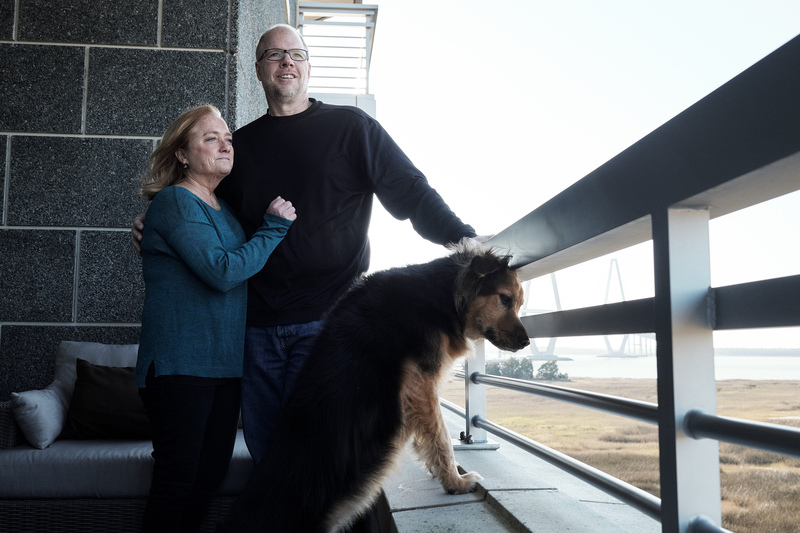 Chris and Kim Nickels with their rescue dog Ripley at their home in Mount Pleasant, South Carolina, on Feb. 13, 2016. Chris and Kim invited me to Seacoast’s Saturday evening services, which started not long before the polls closed. Seacoast looks more like a college campus than a traditional church, with sports facilities, a bookstore, a coffee shop, and people in tidy casual wear, not high dress. At the packed services, minister Greg Surratt noted that a church he visited during the ’70s had a dress code that forbade his then-au-courant bell-bottoms. Even earlier in the service, while noting the state’s political importance, he also made a point of saying the church was formally nonpartisan. After Trump’s win, conservative media mogul Glenn Beck asked listeners and viewers to join him in fasting on behalf of Cruz in advance of the Nevada GOP caucus this week. The mix of residents’ religious affiliation in Nevada is different from South Carolina, with white evangelical Protestants making up 10 percent of the Nevada population; white mainline Protestants 13 percent; Catholics of all races and ethnicities 23 percent; and Mormons 6 percent. “If the country is lost, it will be lost because of the Christians” not supporting Cruz, he said. (Beck himself is Mormon.) But his views of the leading GOP candidate are not universal among religious conservatives. Liberty University president Jerry Falwell Jr., whose televangelist father founded the Christian school, endorsed Trump late last month. A Jan. 30 Gallup poll of people of all political persuasions shows that Trump has a higher unfavorable rating than any eventual nominee from either party since at least 1992. But his support remains strong among Republicans, and that’s what counts during primary and caucus season. In other words, one American’s — or evangelical Christian’s — crazy train could be another’s ticket to ride to what they hope is a better future. I interviewed 15 total voters in four polling places with a mix of economic demographics. At least that many declined to be interviewed. Because polling was on a Saturday, in some cases minutes would go by before any voter showed up.